Image Copyright Brian Robert Marshall. This work is licensed under the Creative Commons Attribution-Share Alike 2.0 Generic Licence. To view a copy of this licence, visit http://creativecommons.org/licenses/by-sa/2.0/ or send a letter to Creative Commons, 171 Second Street, Suite 300, San Francisco, California, 94105, USA. Now I'm not an expert on fish. I pride myself on knowing something about a lot of things, but not a lot about a lot of things. And fish are something that I know little about. 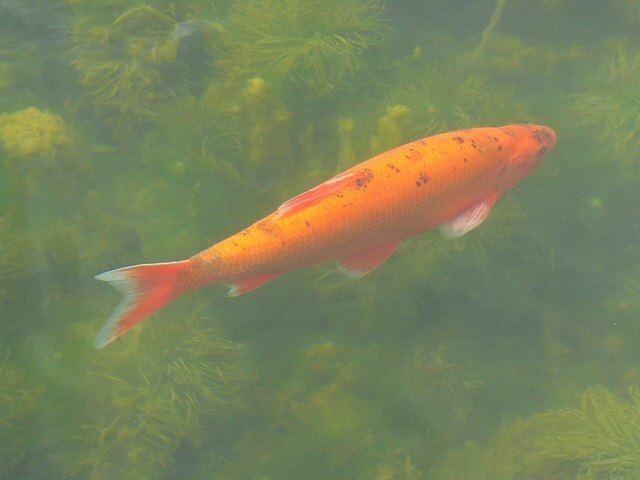 I know that they breathe in water, and swim, and eat fish food (and probably something else in the wild). I know that it's a myth that goldfish only have a memory of three seconds. But apart from that, I don't really know a lot. Anyhow, we were very generously given a fishtank at the weekend. My son loves looking at fish, so it's a cool pet for him, plus they're pretty low maintenance - no walks, no throwing sticks, no combing their hair. I've always quite fancied a fish. So, we headed down to the pet shop to buy some fish. Whoa! You can't just, like, go and buy some fish! You get questioned as to the size of your tank, how long the water has been in there, if fish are already in the tank etc etc. And if you pass the test, you can have one or two fish. Then, a week or so later, you can have a few more. The reason is that the filter sponge in the tank has bacteria in it, that eat the fish waste. And the bacteria have to scale up to the increase in waste caused by more fish. This does make sense. But the amount of hoops you have to jump through to own a couple of the things is incredible. I don't know how they survive in the wild, with no filters, or tropical fish food (our pellet fish food will "do for now" but next time we need to get the right stuff). The other thing is the "size of the tank" issue. Obviously, you need a tank big enough for the fish to swim around in and do their stuff. That's cool. But have you seen the fish in the tanks at the pet shop? There is way more fish in one of those tanks than would be recommended if I owned the tank. Apparently it's okay because "they aren't in the tank very long because people buy them", but I can't say that I fell for that excuse. Surely some of the fish get wise to the little net coming in and nabbing their mates, and head for the ground when the pet shop guy turns up, so they never get picked, and as a result suffer fish depression due to small tankiness. Nevertheless, we've got some fish. They are quite cool, swimming around in what must be a giant ocean of a tank compared to the one in the pet shop, but they are quite good at hiding - as soon as I released them into the tank, promptly one of them vanished, making me check the plastic bag in case it had somehow stuck in the bag and was undergoing asphyxiation. But sure enough it showed up after a while, happily swimming around. I was giving this tale to my parents today (Khat and Ravanna of Guild Ravenswing) and was quizzed "Are they tropical fish? What type of fish are they?". Apparently as they're tropical fish, they need a heater in the tank, which doubles as the light. I had been turning the light off on a night so it didn't scare the fish but it's needed to keep them warm! Sorry fish, I promise to look after you better in future. I was also asked what type of breeders they are - not a clue. I'll go back to the shop and ask!